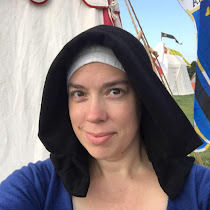 Six or so years ago, I started to get frustrated by my limited knowledge of women's fashion in the era I had chosen to recreate- Flanders in the early 15th century. 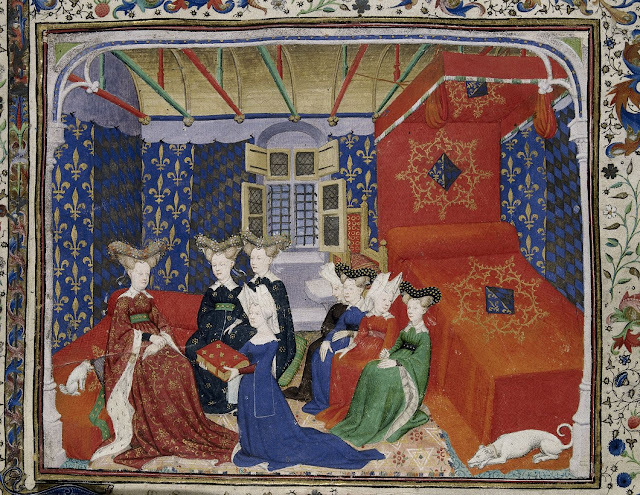 Like many people new to the realm of historical clothing research, up to that point, I had been mostly relying on singular images presented out of context, or the occasional famous manuscript to try to give me a picture of what I should be wearing. The problem with this method, though, is that it doesn't provide overall guidelines to what clothing options were available to women beyond what existed in those single, disconnected examples. Much like with extant materials- you can't form a better picture of the forest if you've only got a small number of individual trees to look at. As I mused over this frustration, I started to imagine a resource- a fashion "lookbook" for the period. An easy reference for what clothing and accessories a woman like me, interested in doing the period justice, could use as a guideline. At the time, however, when I started to collate what I already knew, I got concerned. I'd been studying 15th Century clothing for several years by that point, and when I started to actually think about what fashions early 15th Century women had available, there didn't appear to be much there. Surely Western European women's clothing wasn't that limited. After more thought, I figured out that if I was going to sort out whether that was true and get the information I needed to create a lookbook, I'd need a large number of images. So I decided to start mining manuscripts. I spent several months locating suitable manuscripts, focusing on Franco-Flemish sources (since it would have otherwise become too large and complicated of a project), and amassed over 560 images to review, sort, categorize, and analyze. The result was that I had a "binder of women" that I was incredibly proud to show off to everyone, a large spreadsheet of data, and a massively better understanding of the depiction of women's clothing in the period. If you followed my Doppelganger Challenge in 2017, that project was only possible because of the knowledge I'd gain through that process. The largest takeaway, more than what clothes were actually worn, was that we can't recreate this period (or really most of the Middle Ages) if we ignore social class. The data doesn't make sense, and the patterns don't appear clearly when we try to lump every woman together into a massive bucket. I've said this before- we can't just mix and match. It's impossible to just throw the whole collection of garments and accessories up on a board to say, "Here's what women wore!" When I started to compile all this information together into the lookbook I'd imagined, I got overwhelmed. There was so much I wanted to share. How I had conducted the research; what I discovered when I looked deeper at the totals in each category; colors; context; how we can recreate everything; and all the other great information that comes from a deep dive like this. It has taken me nearly 3 years to figure out what was the most important to share in the format of the Style Book. Today, I am incredibly proud and excited to finally share with you the culmination of this project. 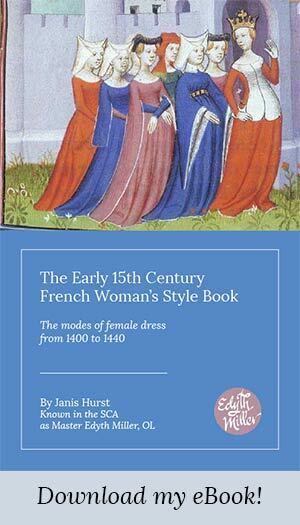 The Early 15th Century French Women's Style Book looks at the three basic tiers of society and provides a crash course in the clothing and style options women in those tiers may have had, based on the commonalities found in the hundreds of manuscript images I reviewed. While I can't claim that this is a definitive guide, and it's important to keep in mind the limitations of the source material, I feel confident in claiming that this guide will help the casual medieval reenactor get her bearings in the period and provide areas of focus for further study and recreation. I truly hope you find this guide useful and a joy to read. Wow! An exceedingly impressive compendium of research. Bravo! Really wonderful work. Thanks so much for your effort. Huzzah, Edyth! This is wonderful - thanks so much for sharing your hard work! Thank you, a really impressive and practical book. "A joy to read" : that's exactly it. Thank you so much for sharing !! !